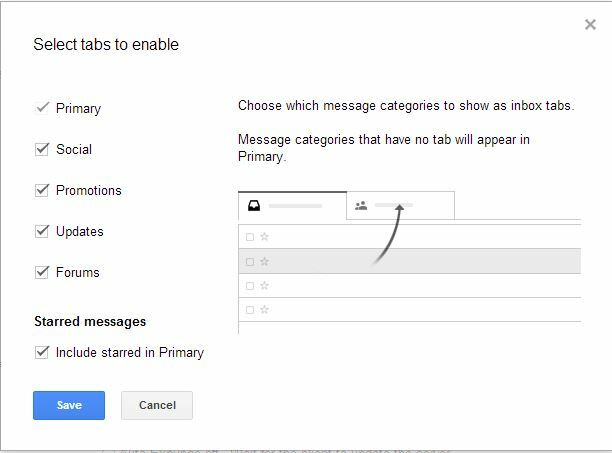 How to Enable the new tabbed design on Gmail Inbox – will show you how to activate the tabbed features of Inbox in Gmail. This is the new features in Gmail after the hangout replaced by the classic chat in Gmail. The tabbed features comes with a lot of control for the user so that by using this features users will decide which type of message they will receive on there inbox. it will categorize the message according to the type and viewed as different tab in the inbox. 1. Login to Gmail using your Google Account ID and password. 2. Click on the Setting (the gear icon) present at the right side of Gmail. 3. 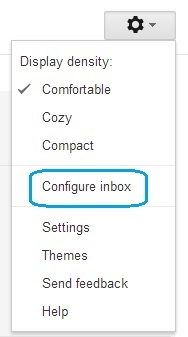 Choose “Configure Inbox” from the drop down menu. 4. A pop up will appear and ask you which type of message (tab) you want to see on your inbox. There are 5 tabs are available now. Primary: Message from Friends and family and other message that don’t appear on the other category. 5. Just tick the check boxes, which type of message you want to see on your Gmail Inbox. 7. That is it. Now the new tabbed features is enable for Gmail Inbox.